Could the next financial crisis plunge the United States into a wide-scale economic collapse? Don’t bet against it. Each passing crisis leaves America with less fiscal and political room in which to maneuver. Anticipating this upcoming knockout crisis, some people have been practicing economic collapse preparation for decades. These individuals are a community unlike all others. For the rest of us, there are several ways to prepare for the next financial crisis; they simply require patience, perseverance, and trust that a “fat tail” event will come…eventually. A fat tail event is a rare and significant occurrence that happens at the end of a bell curve. How do we know a fat tail event is even going to happen? Quite simply, there’s historical precedent to indicate that it will. This precedent is not just in American history—with such events as the Great Depression, the dotcom crash, and the U.S. housing bubble—but also in other advanced societies. These events run the gamut from the collapse of the Roman Empire—arguably the most powerful empire in world history—to the Weimar-era hyperinflation that paved the way in Germany for Adolf Hitler’s rise to power in the early 1930s. History shows that collapses happen to world superpowers. Why? Those societies become complacent, decadent, and fiscally irresponsible. The economic drivers once supporting superpower economies tend to dissolve over time, through economic outsourcing and stalling growth in productivity. Without profound economic, political, and tax reforms to jump-start a transformation into new industrial growth drivers, tax revenues fail to keep pace with the plethora of economic promises that politicians make to their constituents. It should, because that’s the trajectory of the U.S. today. From the bloated public service sector, to $250.0 trillion of unfunded liabilities, to a war machine dwarfing anything remotely known in human history, America is there. Without four percent GDP growth annually, year after year, something’s got to give. And we all know that four percent growth is not happening. Your family’s economic collapse preparation plan should be in place in case a Wile E. Coyote moment comes to pass. How Will the Collapse Happen? There are countless scenarios which could lead to a collapse of the U.S. economy. Options are only limited to one’s imagination. However, some scenarios are presumably more likely than others, based on known information. A high inflation or stagflation scenario is certainly possible, considering the sad state of America’s finances. Simple intuition tells us it’s completely unsustainable to run up trillion-dollar deficits year after year. There’s already $20.0 trillion of federal debt on the books, and state government finances are a disaster. Even the Congressional Budget Office (CBO), known for its very optimistic projections, is expecting 150% debt-to-gross-domestic-product (GDP) ratios, not including intra-govermental debt. Add 50 basis points to that number for expectations that are closer to reality. If four percent perpetual growth doesn’t materialize soon, expect further debt run-ups and monetization, which will bring higher inflation and further degradation of purchasing power closer to becoming reality. 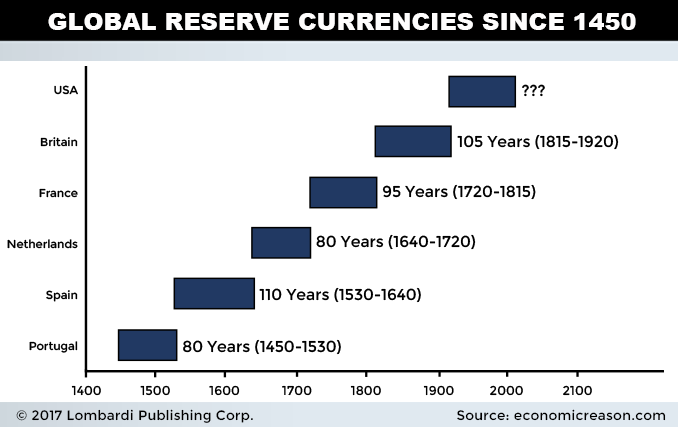 Certainly, there’s also a risk of the U.S. dollar losing reserve currency status. Foreign demand for U.S. dollars as a means of trade keeps demand for the Greenback strong. Many countries are looking for alternatives to the dollar. Should alternative currencies become accepted—several countries are attempting to circumvent the U.S. dollar in trade—the dollar’s value could crash. The fast emergence of cryptocurrencies might soon shave another sliver off of the demand for dollars if central banks officially recognize cryptocurrencies as assets. Sometimes a thousand paper cuts are as sharp as a knife. The dollar’s natural dominance could be coming to an end, like many other currencies before it. It might not seem like much, but money market funds are supposed to be a guaranteed source of short-term liquidity. Had the U.S. Treasury not stepped in, businesses might have run out of cash to fund day-to-day operations. In other words, economic collapse was at the doorstep. A large-scale terrorist attack could also do the trick. Whether emanating from a radiological weapon or possibly an electromagnetic pulse (EMP) detonating over a metropolitan city, a large terrorist event could cause a crippling and prolonged economic downturn. This is exactly what happened after the unfortunate events of September 11, 2001 befell the United States. If a bigger attack were to shut down New York City for an indefinite time, the resulting carnage would make 9/11 look like child’s play. It’s hard to pinpoint the best way to prepare for the next financial crisis, because change can be drawn out or happen suddenly. Any economic collapse preparation plan should incorporate both immediate and long-term solutions. An example of an immediate need would be food and water. Everybody needs nourishment on a regular basis in order to survive. You wouldn’t want to be constantly searching for your next meal when the economy collapses. You’ll be among the untold millions of people competing against others for the remaining scraps resting on store shelves. If you’ve seen the Black Friday videos from stores like Wal-Mart Stores Inc (NYSE:WMT), where people violently attack each other over discounted toasters, you can easily imagine how aggressive people would become with their lives on the line. Longer-term needs would be non-essential consumer staples. Vice items like alcohol and cigarettes would be nice to have, but not essential to your survival. Economic collapse preparation is about survival first, and you can’t store everything. Prioritizing needs by starting with the basics is always a smart decision. When the you-know-what hits the fan, your comprehensive economic collapse preparation list can save your life. Here are five must-have items to put on your list. In an economic collapse, it may be prudent to leave the country for a little while. Perhaps your community has faced irreparable ruin, or maybe the collapse is the impetus for you to permanently live the good life abroad. Possessing your passport makes sense, because the government may not be running at full capacity during an economic collapse. The mail service may also be impaired, adding uncertainty to the mix. Depending on the type of collapse, the U.S. dollar may lose a significant portion of its purchasing power. Owning all your liquid assets in U.S. dollars is unwise. Liquid assets don’t necessarily have to be precious metals like gold and silver, but it helps. Many types of tradeable commodities will still be in demand after an economic collapse. Vice items, protective gear, and non-perishable food will likely generate a high return from the unprepared. Gold will remain the king asset, but keep in mind that it’s bulky and heavy. Every great economic collapse preparation plan should include an overabundance of valuable and transportable commodities that people will covet regardless of collapse type. Think of the bartering economy on steroids. There will be unrestrained demand for items like flashlights, portable radios, and solar panels. If you can acquire these items cheaply as collateral, do so. This one is a no-brainer. In an economic collapse, millions of unprepared people will get desperate enough to become dangerous to you, as their basic needs aren’t met for an extended period of time. Those amazing neighbors of yours may become totally unrecognizable once desperation kicks in. You’ll want to arm yourself in case you’re forced to defend your property. A mixture of short- and long-range weapons is ideal, as you won’t necessarily want to use a rifle in hand-to-hand combat. For defensive protection, Kevlar vests make great choices. The better ones are stab-proof and can stop small bullets. Portable alarms can ward off would-be attackers. The safest fight is the one you avoid. Another no-brainer. Keeping a six-month supply of long-dated, non-perishable food will prevent you from having to rummage for nourishment if America’s food supply chain comes to a grinding halt. A reliable water filter is also a must-have item. Quality “straws” with built-in filters can make the dirtiest stream a legitimate source of drinking water in a pinch. The municipal water supply may not be operational if power is cut or the water source is deliberately poisoned. This category probably doesn’t get the attention it deserves. One of the consequences of the next financial crisis is the soul-sucking nature of the situation. Picture your entire life savings getting wiped out, your six-figure salary suddenly stopping, and no longer being able to enjoy lazy Saturday afternoons by the pool. Psychological stress can accumulate quickly and leave the unprepared in an incapacitated mess, similar to post-traumatic stress disorder (PTSD). Preparation for the next financial crisis should include significant forethought of techniques to cope with living in an ultra-stressful environment for a prolonged period of time. Whether that’s brushing up on Psych 101 or purchasing a Tony Robbins inspirational book, don’t underestimate the importance of mentally coping. This attribute doesn’t come naturally to many, and will actually lead to the demise of many people who simply “shut down” from the emotional pain and anguish they experience. How Likely Is the Next Financial Crisis? Another financial crisis is very likely, if history is any indication. Not only are broad economic downturns a reality in modern western business cycles, American governments has been preventing them from playing out to their natural conclusions. Recessions haven’t been allowed to cleanse the system the way they’re suppose to. Bad businesses have been propped up, too-big-to-fail banks recapitalized at the taxpayers’ expense, and more government debt has been piled on. Moral hazard is still rampant within the economy. The reality is, none of the issues resulting from the most recent U.S. housing market crisis (and the previous ones, for that matter) have been fixed. America’s problems have simply been papered over. This makes the upcoming financial crisis a certainty. It’s just a matter of the timing and the type. Make sure your economic collapse preparation plan is up to date, preferably with the items listed above. Store what you can outside of the banking system, to avoid bank runs or “bail-ins.” Don’t underestimate how stressful the collapse can be, and train to become mentally tough. Realize that your current lifestyle is fragile, and can change literally overnight. These are just a handful of suggestions, but hopefully they provide you with a good starting point. Let’s all hope they’re never actually needed.